Word of the day: Quaerens. It’s SLIG week this week, as 360 students have descended on the Salt Lake Hilton for a week of learning at the 2016 Salt Lake Institute of Genealogy. The Legal Genealogist has just about enough time to breathe between classes. Four classes a day times five days, and I’m “only” teaching in 19 of those sessions. Sure: Quaerens nihil capiat per billam. That should clear it up, right? It’s simply Latin for plaintiff;1 the person who is starting a lawsuit by bringing some type of complaint against somebody else. And Quaerens nihil capiat per billam? Queer words in the law, for sure. 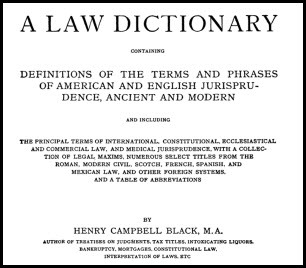 Bouvier’s Law Dictionary and Blackstone’s Commentaries on the Laws of England are useful for the era before Black’s Dictionary of Law was published. And there are earlier dictionaries as well, and many have been collected (and I’ve written about the collection here) at the Georgetown University Law Library.